Where on Earth is the magnetic field intensity stronger? Are there places on Earth that have a strong magnetic field other than the magnetic north and south poles? If we consider only the magnetic field generated by natural sources, and not the ones generated by human activities. The general trend is that higher intensities of the magnetic field happen close to the magnetic poles. However, this is just a general trend. The southern hemisphere experiences the highest magnetic fields intensities, reaching over 65,000 nT, and this southern maximum matches fairly well with the south magnetic pole. In contrast, in the northern hemisphere, the maximum happens in Siberia, quite far from the north magnetic pole that is currently very close to the geographic north pole. The contour interval is 1000 nT, grid lines interval is 10°, and the green dots represent the south and north magnetic poles. The maximum intensity contour in the northern hemisphere happens in Siberia with a value of 61,000 nT and the center of the contour is located roughly 3,100 km away from the magnetic north pole. The maximum intensity contour in the southern hemisphere is between Australia and Antarctica, with a value of 67,000 nT and the center of the contour is located roughly 450 km away from the magnetic south pole. However, these anomalies are measured at an altitude of 5 km above mean sea level, and have a resolution of 3-arc-minute resolution (~5 km). Therefore, it doesn't rule out the existence of very strong and localized small scale anomalies, that might lead to large variations on the magnetic field intensity but over a very small area. 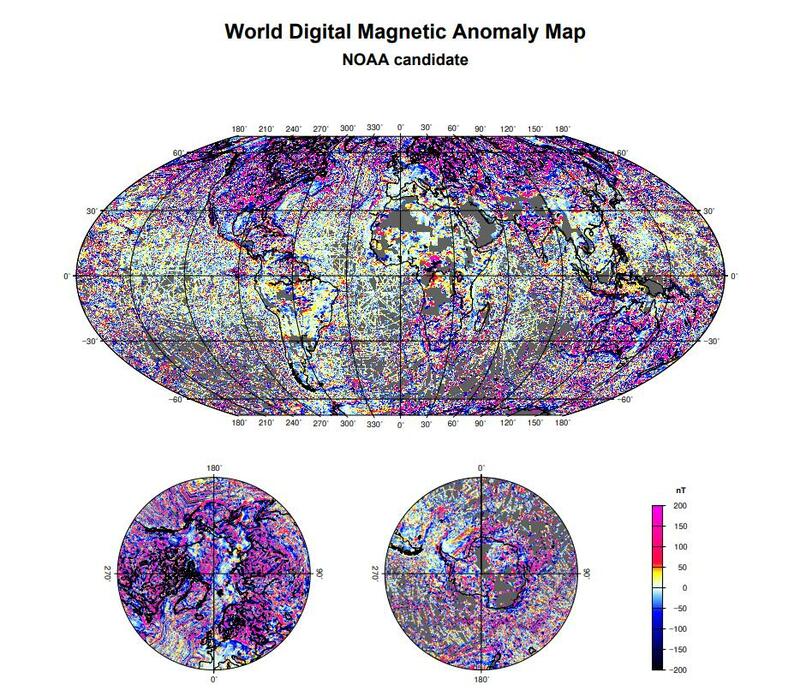 The maximum value within the World Digital Magnetic Anomaly Map dataset is 8570.78 nT, but even considering all anomalies, the largest field intensities remain within the same contour near the magnetic south pole. Since it is not specified in the question (and to complement the other answer), the strongest magnetic fields on Earth are not naturally generated, but artificially. The current world record holder seems to be the National High Magnetic Field Laboratory (NHMFL) in Los Alamos, USA, with a magnetic field strength of about 100T (so about two million times higher than the Earth's magnetic field). This quora answer suggests that they have since increased it to 300T. There are a few other high magnetic field laboratories in the world, for example the Helmholtz-Zentrum Dresden-Rossendorf (HZDR) in Dresden, Germany, which briefly held the record before with a field strength of 91.4T. These magnets are usually pulsed magnets, so they cannot maintain the field strength for longer than a few milliseconds. For longer durations it seems like the MagLab in Florida, USA is currently holding the record with a 45T magnet. Not the answer you're looking for? Browse other questions tagged geophysics geomagnetism mapping natural-conditions field-measurements or ask your own question. Where on Earth is the highest none polar magnetic fields? How did the intensity of Earth's magnetic field change through geological time? Does solar wind perturb Earth's magnetic field ? If so, what are the consequences? How close to the magnetic poles will a compass be accurate? 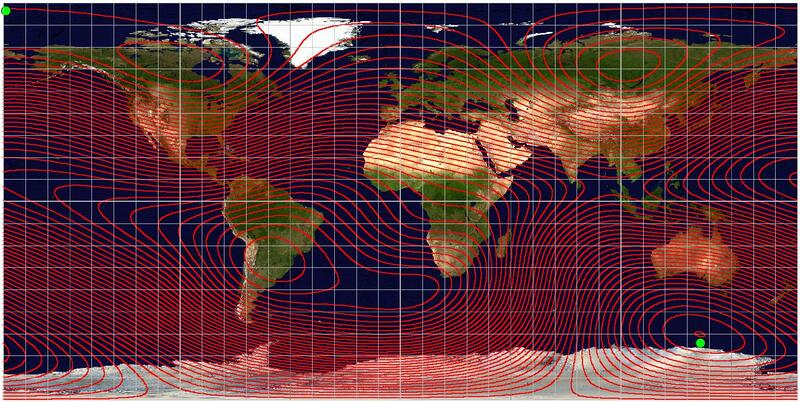 Does the magnetic field really protect Earth from anything?